Shelley moves on | The Spartans FC Official Website – Live together. Play together. Win together. 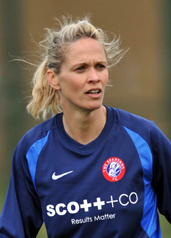 Spartans Shelley Kerr has announced that she is to step down as Head Coach of Spartans FC women’s first team to concentrate on her Scottish Football Association roles. All involved with Spartans are grateful for her leadership over the last two years. We wish her well in her role as Head Coach of the Women’s U19 National squad. Shelley has led the Scotland youngsters through two qualifying stages meeting difficult opponents along the way. Her charges will soon be participating in the Euro Championship Finals in Macedonia competing with group opponents England, Germany and Italy. Carson Ralton commented “Shelley is an excellent coach who is committed and passionate, during her time as head coach she has raised the level and expectations of this club. 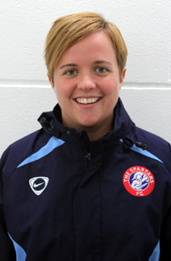 I have absolutely no doubt Shelley will go on to coach at the very highest level in the future, I look forward to following her progress in the game and wish her the utmost success, I am delighted that Shelley will continue as a player with Spartans as her experience on the field is invaluable”. Ralton continued “Despite this set back on a brighter note we are very fortunate to have Debbi McCulloch as assistant to Shelley and with immediate effect Debbi has accepted the opportunity to take over the Head Coach role. Debbi is an excellent highly respected coach who will revel in the lead role”. When asked how she felt about her new position Debbi stated, “Although I am disappointed that Shelley has decided to stand down I fully understand that her priorities lie with her SFA duties. I am however excited to be taking on the more challenging role of Head Coach. I have learned a lot from Shelley in all aspects of the game and I am keen to take that learning forward while also introducing ideas of my own. We have a great bunch of players at the club and fantastic support from the Spartans family, it is great place to be and I am eager to build on what has already been achieved”.